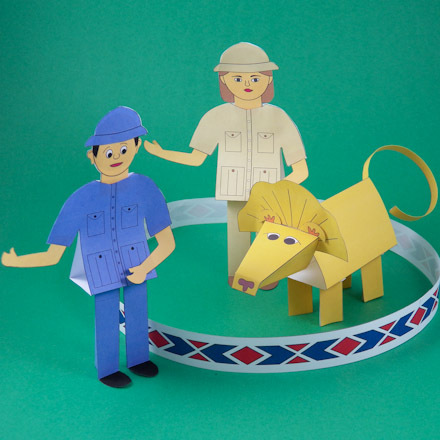 In this project, you will make a circus lion and circus lion tamer. The lion act is the second ring of your three-ring circus. 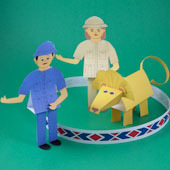 Make a circus ring from the Ringmaster project to complete the lion act. For more crafting fun, you can decorate the lion's mane and the lion tamer's jacket using the ideas and techniques introduced in the Decorative Craft series. Related crafts: This is the third of four craft projects for the Under the Big Top craft series. Make all four projects for a complete three-ring circus! Choose the size of circus lion or lion tamer you want to make. Download and print the pattern. There are two sizes of lions and both male and female lion tamer patterns. Print the colored patterns on white paper. Print the black & white patterns on colored paper, or print them on white paper and then color with crayons or markers. 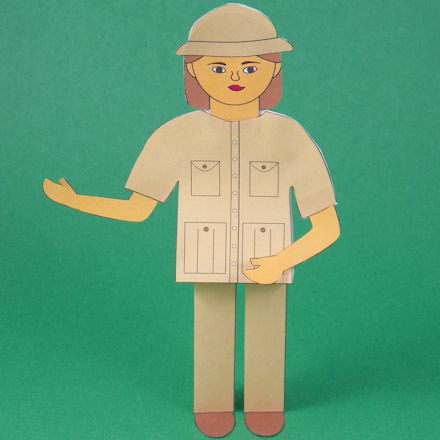 Use the Circus Rings pattern in the Ringmaster project to make a circus ring for the lion circus act. To make the Lion Tamers, follow the instructions for the Circus Ringmaster. Cut out each pattern piece on its black outline. There are ten pieces for the lion: body, four legs, head, mane, two glue strips and the tail. If you printed a black & white pattern, either color the pattern pieces before cutting them, or cut out and trace the pieces onto colored paper. Tracing tips: (optional) Trace each pattern onto a piece of colored paper. Use paper that is as heavy as computer paper or heavier. Use any colors you like. Be sure to transfer any fold lines or marks to the colored paper. Cut around the traced patterns. Folding and assembling the lion is easier if you score the fold lines—marked with red in the illustration to the right. To score, place a straight edge or ruler along a straight line. Use a dull point, like an empty ballpoint pen or bone folder, and run it along the line using the straight edge as a guide. Fold the leg on each vertical line, and form into a triangular shape. Put glue on the tab and join it to the inside of the first section. Put the eraser end of the pencil inside the leg and draw it down the tab to ensure a good join. Repeat for the other three legs. Tip: The legs should stand on their own. Fold the body on each line, and form into a triangular shape. Put glue on the tab and join to the inside of the first section. Ensure a good join by running your finger along the glue tab. Clip the lion's ears away from the sides of the head, and fold the ears up. Fold the nose down. Make mountain folds on each of the four lines on the lion's head, form into a head shape, and glue the bottom flaps together. Cut the sides of the glue tab on the lion's mane, fold the tab up, and glue it inside of the lion's head. Put glue on the tabs of each leg and attach them to the bottom of the body. Glue the glue strips halfway inside of the lion's body at the top. 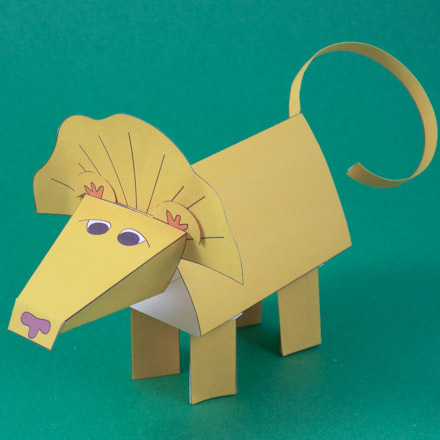 Fold the strips back and apply glue to attach the lion's mane to the body. Fold the narrow strip of paper for the tail in half and glue the sides together. Curl the tail over a round pencil or pen and glue it inside the back of the lion. Tip: You can also make the tail from a length of yarn or ribbon. Make your lion more spectacular by decorating the mane. You can use any of the Decorative Craft series technique. Gluing open coil quills to the mane looks particularly nice. Make 10 to 20 open coil quills with ¼" by 6" strips. Glue the coils all over the mane for a curly effect. That's it! You are done with the lion! Put lions and a lion tamer together to make a circus act. For another circus ring, make the Circus Seal. Tip: Make the lion tamer following the instructions in the 3D Paper Circus Ringmaster craft project. Tip: Use the Circus Diamond and Arrow digital paper to decorate accessories for the crafts in the Under the Big Top series, in handmade greeting cards, or any paper craft. This ePaper coordinates with the Circus Paper Ribbons digital download. 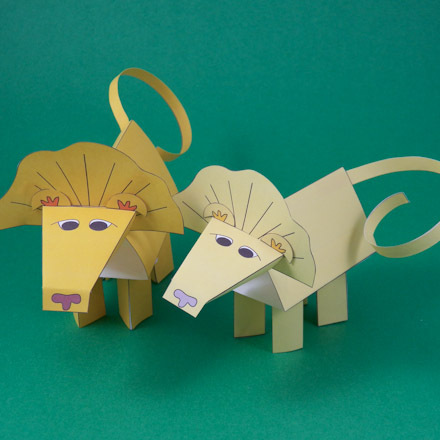 Tip: Make more than one lion for your circus act featuring lions and lion tamers. Tip: To make a curled tail, draw the folded tail strip over a round pencil or pen. Use your thumb to hold the strip against the pencil and pull the strip with the other hand. Trim the tail to any length desired.